Looks like Summer is still here and because of that I decided to wear a striped blouse along with bright orange pants and Zara lace heels for a feminine finish touch. Speaking about feminine touch here is another great necklace thanks to JEWELIQ.com as accessories . You have an original outfit. I like the burst of colors and every piece from the combo. Gorgeous necklace and pants, you look super lovely! Love the stripes with bright colors! Great necklace! those pants got amazing orange color! Thank you Gillian ! I use an Olympus E 420 wit 50 mm and 70-300mm lens. Amazing combo ! Those orange pants are to die for ! Love the combination of this necklace with the striped top! Even though I’m not a big fan of orange.. this outfit is really beautiful! 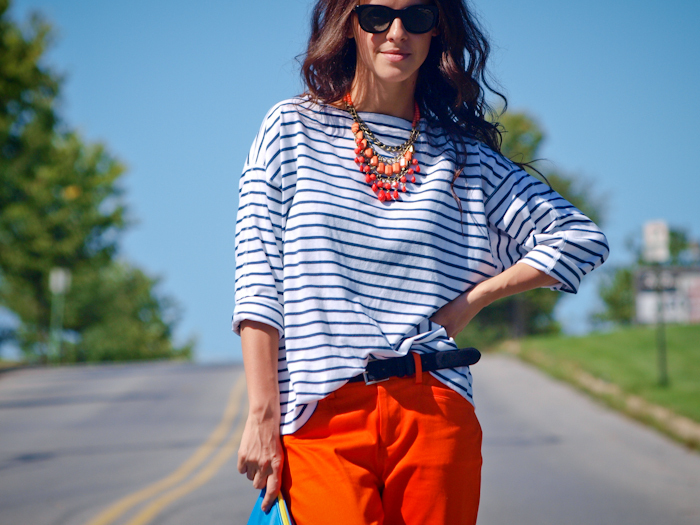 Love the combination of the orange trousers with the striped top and orange necklace! Great look! I like the combination of stripes and these orange pants! love this look! so sporty and stylish! Beautiful! 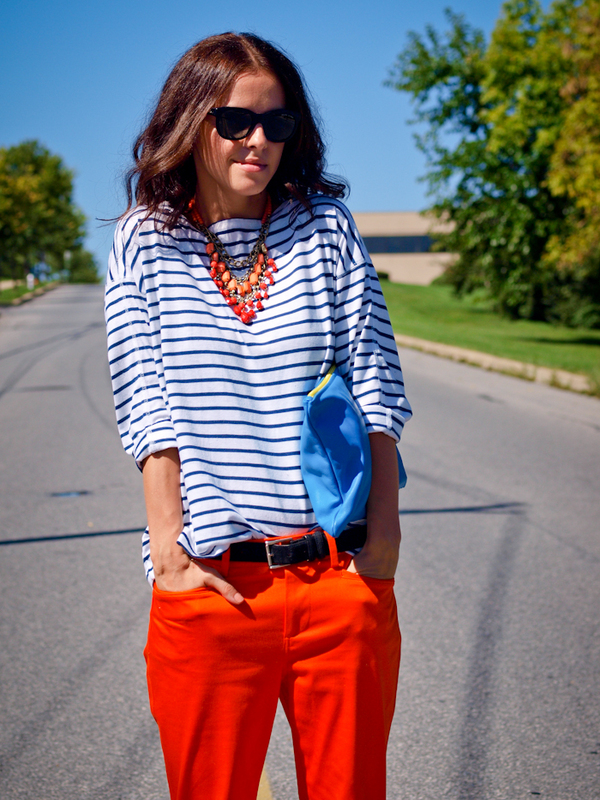 Love the stripes and the bold pop of color from those pants! gorgeous outfit, very stylish for fall! Love this bright look! Those lace heels are so pretty too. I’ve been loving the instagram snaps of this look and in full, it’s beyond incredible! 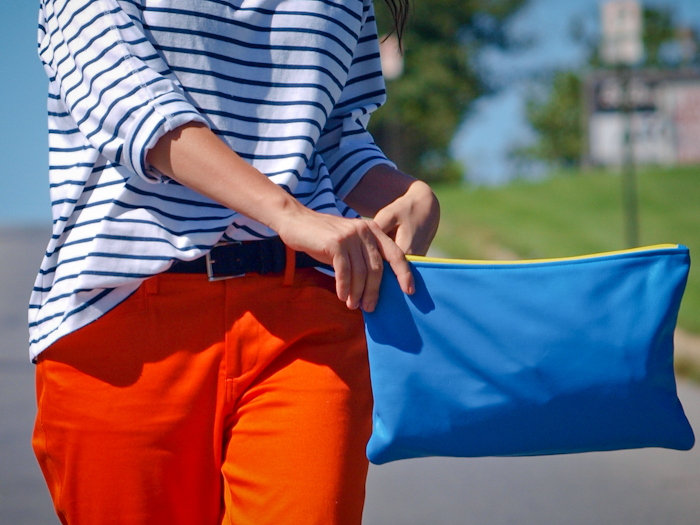 Love the hits of orange here and how you combined the brights fearlessly with stripes. Stunning as always! Such a cute look! Love how you added the thick belt! Fab pants. Love your stripe top. I love the most your “Loose” looks! A nice colored pant with simple shirtand low hills – perfect to me! The pulsing boldness of the color through the pants makes this casual chic ensemble so interesting and gloriously hot! !